Every day I put my best face forward. And I can finally say I have reached a confidence level with my skin so that I really believe that it is my best face. It hasn’t always been like this though. My skin was definitely at it’s absolute worst when I was using commercial skin-“care” products. I cringe now when I look back at the amount of money and time that I spent putting toxins onto my skin and ultimately into my body — it’s crazy. I began to see dramatic, continual improvement in my overall skin tone and my occasional acne once I learned enough to stop washing my face with soap, stopped using commercial cleansers and moisturizers, and started wearing mineral makeup on the occasions that I need to. When I ditched soaps and cleansers for cleaning my face I switched to just using witch hazel as my facial toner, which I would then follow up with an essential oil (or blend) mixed with a carrier oil that suited my skin. This routine worked very well with and for my skin. 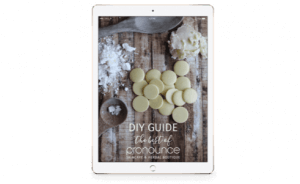 But for me, living a DIY #LifeFromScratch means that I am always trying to come up with different ways to combine natural ingredients in a way that will be beneficial to my changing needs. My goal in any of my DIY recipes is simplicity (or as close to simplicity as possible). So, my initial thought was to simply combine essential oils with the witch hazel. Then my dad gifted me with a small potted rosemary plant. I am pretty sure that I am one of the very few people on this planet who does not like rosemary for cooking. I do enjoy the aroma of rosemary, but have never really liked the taste it imparts to recipes. What was I going to use it for since I didn’t really care to cook with it? I am well known for killing innocent houseplants. I don’t try to, it just happens and I just accept it as part of who I am. I stick to outdoor plants for the best results. Then I started reading and realizing that it would be a great herb to use in a skincare recipe. 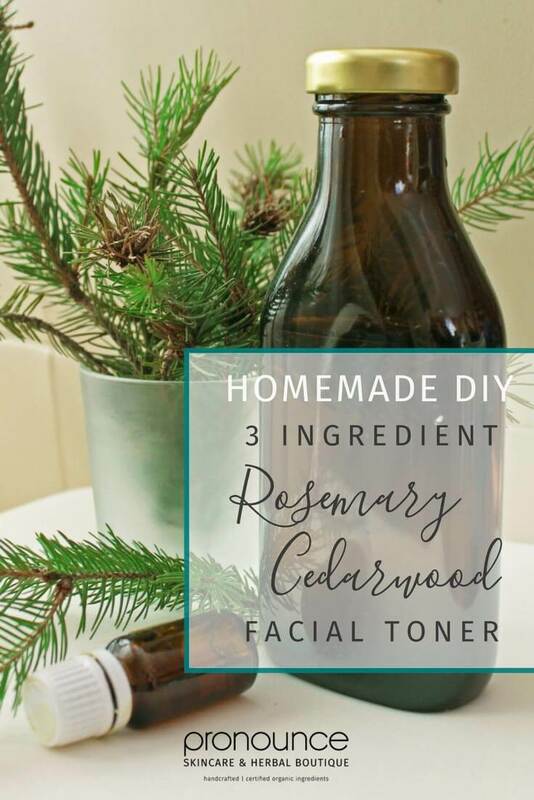 And since I was looking to add some additional oomph to my plain old witch hazel facial toner routine I decided to infuse rosemary leaves into the witch hazel and add cedarwood essential oil (which is one of my favorite essential oils for skincare) to the mix to create this 3 ingredient DIY rosemary cedarwood facial toner. The ingredients in this facial toner combine to create a grounding, woodsy aroma while cleaning and toning the skin. It’s gentle enough to use daily and preps your skin for moisturizing. Your face will benefit from the pore tightening and overall smoothing effects of this simple DIY toner — I have really been enjoying this creation. My routine has been to remove my mascara with either coconut or sweet almond oil. Next, I wash my entire face with hot water to open my pores. I then apply the toner with cotton balls, using small circular motions all over my face to remove any excess makeup, dirt, and oil. Then I apply my moisturizer which usually is just a carrier oil (or blend of carrier oils), sometimes with a couple drops of ylang ylang and lavender essential oils. My skin feels clean, smooth, and nourished. Made from the bark of the witch hazel shrub, witch hazel extract makes a wonderful light astringent and helps to tone and tighten the skin. Due to its mild antibacterial properties (1) it is beneficial for acne prone and oily skin. 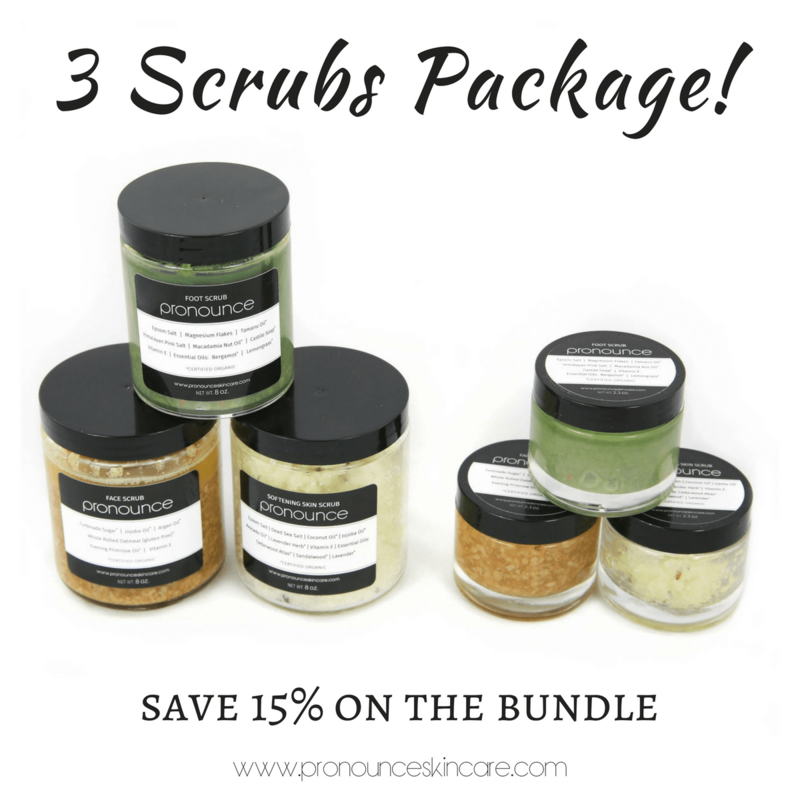 Bonus… regular, healthy skin will enjoy the rejuvenation and refreshing qualities, too. Using witch hazel bark you can easily make your own witch hazel extract. Grab our easy to follow recipe here for homemade DIY witch hazel. Witch hazel extract is the base for a perfect skin toner, and can also be used in place of a cleanser. Because it is so mild, it can be used alone, or you can combine or infuse it (like we are doing here today) with various herbs. 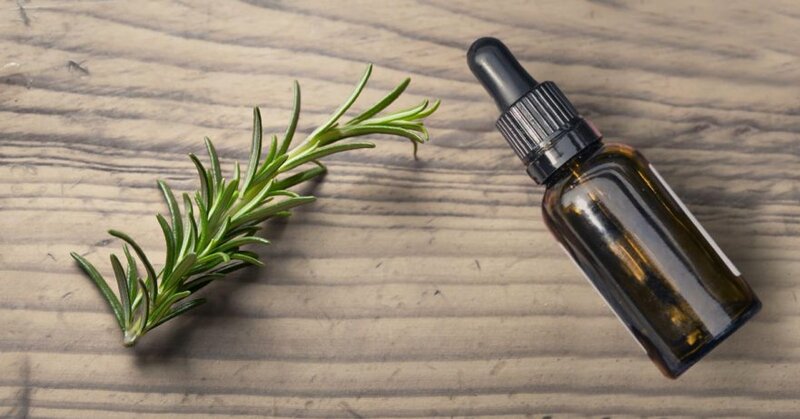 Probably one of the most well known and used herbs, rosemary is not only distinctive and delicious in cooking but when used on the skin it’s antioxidant properties promote healthy circulation while the scent of rosemary enhances mental alertness (2). Steam distilled from cedarwood, this essential oil has regenerative and astringent properties to help promote clear, healthy skin (3). It’s woody, dry aroma is wonderfully grounding in skincare recipes. 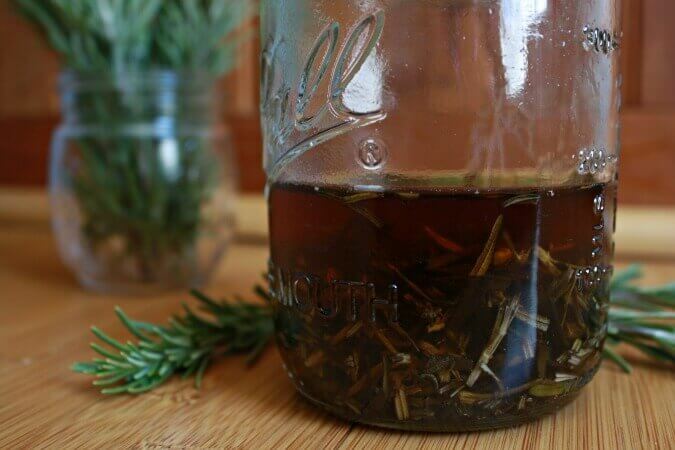 It blends well with rosemary, which made it the perfect addition to this facial toner. You’ll want to allow this to infuse for about 2 weeks. Once 2 weeks has gone by, strain the herbs out and the infused liquid will go into a new, clean jar. Add 30 drops of cedarwood essential oil into the infused toner, cover and shake to combine. If you want a stronger cedarwood scent, add up to 10 additional drops*. Add your label to the new jar and enjoy your new toner or give as a gift! Looking for a handmade, organic facial toner already made for you? Simply not enough hours in the day for DIY? Pinning more than you could ever tackle these days? No worries. I have got you covered. 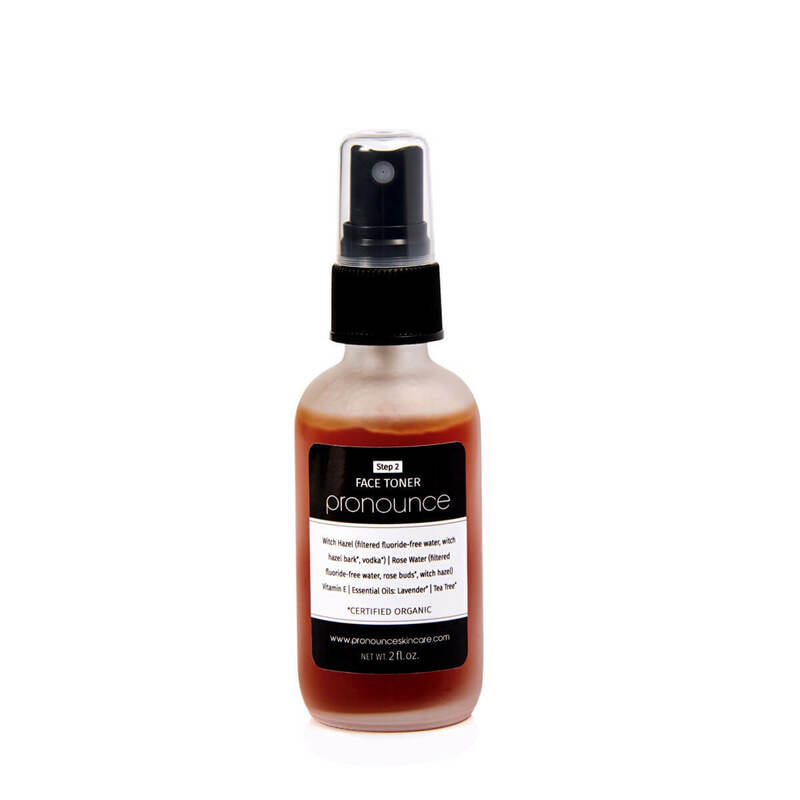 Please, head on over to the Pronounce Skincare Shop where we sell this toner, which contains our handcrafted witch hazel extract. While you are there, please look around at all of the other skincare creations. We love making them for our families and for you!